Apple has released a new Apple TV application called iBooks StoryTime to encourage parents and kids to read children’s books on big screen TV. Apple debuted this new app for tvOS on Thursday, with features like "Read-Aloud," which syncs the audio with the on-screen text that narrates books and flips the pages for you automatically. Read-Along books are audio-enhanced with different character voices, clear sound effects, and word-for-word narration that kids can follow. In some cases, there are also words highlighted on-screen as they are read aloud. Kids can flip through the pages of the books on their own by swiping with the Apple TV remote after turning off the"Read-Aloud" feature. via iBooks StoryTime App for Apple TV is Designed to Narrate Childrens' Stories : FUTURE TECH : Telegiz: The Latest Technology News and Cool Stuff. 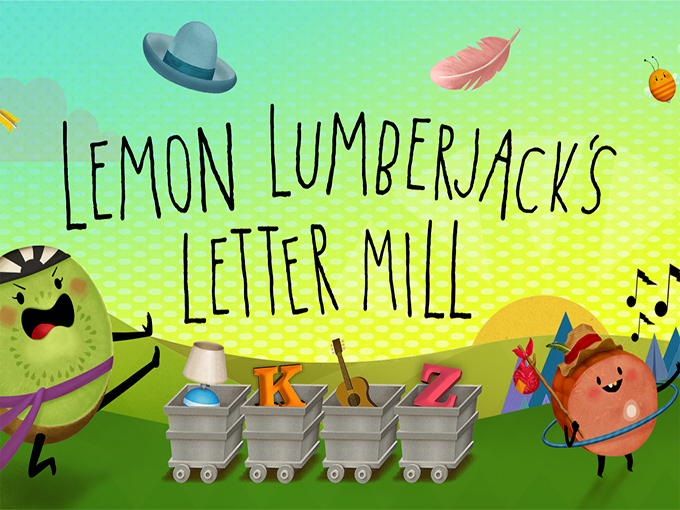 Brand owner American Greetings Entertainment, in partnership with acclaimed Portland, Oregon-based digital app creator Night & Day Studios, has launched Lemon Lumberjack’s Letter Mill, a new kids learning game and alphabet storybook app. Currently available for iOS devices, and coming to Google Play this summer for Android, the freemium app and lets players complete 54 age-appropriate levels and earn daily rewards by matching letters and objects as they move down a conveyor belt in Lemon Lumberjack’s mill. Targeting children of all ages with a focus on six- to eight-year-olds, the app teaches letter recognition for pre-readers and builds fundamental spelling and reading skills for older kids. via Kidscreen » Archive » American Greetings launches new digital kids property. The UK Literacy Association (UKLA) is launching an award for digital e-books and apps for children aged 6-8. The Digital Book Award, created in association with Booktrust and sponsored by the Open University, is open todigital products that use sounds and visuals to make a children’s experience of a story richer and more meaningful. Apps (for IOS or Android), e-books, online and web products, and digital products viewed on a PC or mac, are all eligible as long as they were created by publishers or developers in the UK between 1st June 2014 and 28th February 2015. A team of academics will choose a shortlist, which will not be made public, before teachers in selected schools choose the final winner. The deadline for entry is the 25th March and the winner will be announced at a the UKLA International Conference in July. 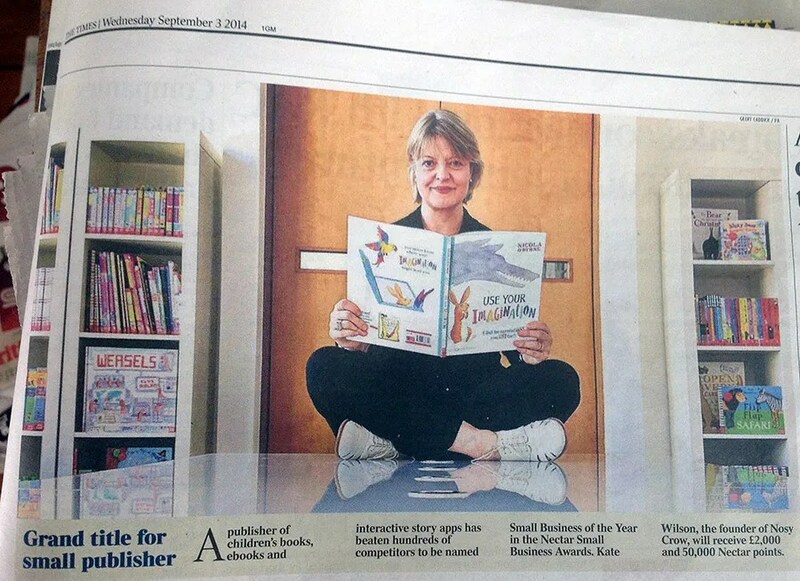 via New award for children’s digital books | The Bookseller. Congratulations to Kate Wilson & Nosy Crow, who receive £2,000 and 50,000 Nectar points on being named Small Business of the Year. Jack and the Beanstalk App : where on-screen gaming and reading meet. Nosy Crow have just launched a brand new fairy tale app, Jack and the Beanstalk, out now on the App Store, claiming it’s their best one yet, blurring the distinction between story and game more than ever before to create a completely new kind of reading experience for children: Jack and the Beanstalk is where on-screen gaming and reading meet. “There isn’t a single trend that will have a bigger impact on our business in the next year than the move to mobile,” said Kristen McLean, founder of books analytics start-up Bookigee, speaking at Launch Kids at Digital Book World 2014 in New York. McLean cited several data points to support that readers are moving to mobile devices versus desktops for their media consumption. According to data from research firm eMarketer, more time was spent on mobile devices last year than on household computers for the first time ever. “Mobile strategy is essential for the future of our business,” said Deborah Forte, president of Scholastic Media, also speaking at the conference. Scholastic recently launched a mobile app that is meant to help parents and kids connect with print books at book fairs. In its first two months, the app was downloaded 55,000 times, according to Forte. 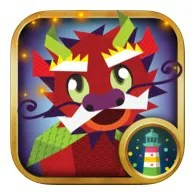 via Children’s Publishers Look Toward Mobile as Next Frontier | Digital Book World. This weekend’s Observer Tech Monthly featured “The Best of British Startups” as represented outside of London in places like Brighton, Edinburgh, Bristol & Bath and Belfast (these four given double-page spreads); also Newcastle and Manchester (both full-page spreads); with other cities summarised on a final page listing. It struck me how few of these companies are focused on children’s entertainment or education, an exception being Brighton-based Lighthouse Learning, co-directed by Danielle Barnetche and Alex McGregor. 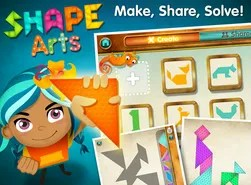 This company’s tagline is “Where learning is delightful” and they have so far created two well-received apps – Dragon Shapes: Geometry Challenge and Shape Arts: Geometry Creations.